Anthony E. Fox, O.D., M.S. White eye discharge typically signals eye irritation, which can occur with a variety of eye ailments. Irritation of the conjunctiva -- the thin tissue that lines the eyelids and covers the surface of the eye -- is the most common cause. Conditions affecting the eyelids are also frequently to blame. Other eye conditions can also cause white eye discharge. Accompanying signs and symptoms and an eye examination help differentiate among the possible causes of white eye discharge. Conjunctivitis, also known as pink eye, refers to inflammation of the conjunctiva. This condition usually affects both eyes, typically beginning in one eye and then spreading to the other. Most cases of conjunctivitis are due to a viral infection, although a bacterial infection is sometimes to blame. Watery, stringy or white eye discharge is common with viral conjunctivitis. Other typical symptoms include eye redness and pain. Bacterial conjunctivitis causes similar symptoms but the eye discharge is usually thicker, more abundant, and yellowish or greenish in color. However, the color and consistency of eye discharge cannot be used to definitively differentiate between viral and bacterial conjunctivitis, as there is significant variation. Irritation of the conjunctiva can occur due to noninfectious causes. Allergies that affect the eyes, such as a pollen or pet danger allergy, are commonly associated with itchy, watery eyes and a stringy discharge that may be clear or white. Among contact lens wearers, a condition called giant papillary conjunctivitis (GPC) can develop. 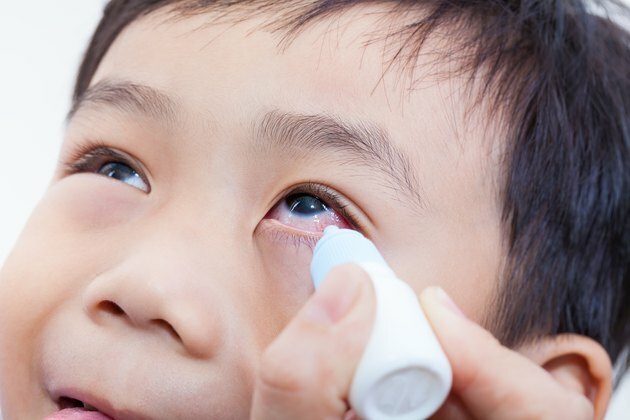 This allergic condition commonly causes eye redness, swelling and whitish discharge. Dry eye syndrome represents another frequent cause of noninfectious conjunctivitis, which can cause stringy clear or white eye discharge. Airborne irritants, such as cigarette smoke and chemical fumes, might also be to blame. In some people, sensitivity to preservatives in eye drops or contact lens solutions might irritate the conjunctiva, leading to redness and eye discharge. Blepharitis describes inflammation of the rims of the eyelids of both eyes. This common condition usually develops gradually and tends to persist or recur. Whitish to yellowish eye discharge can occur along with redness of the rim of the eye, eyelid swelling, crusts or flakes in the eyelashes, and a gritty or itchy sensation in the eyes. Staphylococcal bacteria, malfunction of the oil glands near the eyelashes, and a skin condition called seborrheic dermatitis -- or a combination of these factors -- typically contribute to the development of blepharitis. Although far less common than blepharitis, tumors of the eyelids can cause symptoms virtually identical to those of blepharitis.